Use 1 tbsp oil to grease a 1-litre gratin dish. Put the milk and nutmeg into a large pan over a low heat. Just before it boils, pour in the polenta, stirring constantly. It will thicken. Lower the heat and stir for 4-5 minutes. Remove from the heat, stir in 2/3 of the Gruyère. Season. Spread in the dish. Sprinkle with the remaining Gruyère. Set aside. Destalk the shiitake mushrooms and rip into chunks. Trim the brown caps, slice and add to the shiitakes. Trim the oyster mushrooms and rip into chunks. Set aside separately. Heat 4 tbsp oil in a wide pan over a low heat. Fry the shallots and garlic until soft. Add the shiitakes and brown caps. After 1 minute, add the oyster mushrooms. Once soft, add the wine and herbs. Season. Cook until the wine reduces by half, then stir in the butter. Meanwhile, grill the polenta until golden and bubbling. 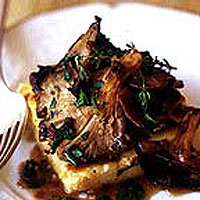 Slice and serve straight away with the mushrooms.